input to 4. Human resource allocation simulation Output: The maximal laborpower capability Fig. 1. The THPR Model. BPR philosophy is applied to integrate organizational functions smashed in different departments into independent and complete new processes, and team approach is used to design a teambased organization to facilitate the newly-designed process. Accordingly, two primary purposes are served in this phase: 1. Redesign the process model: Problems hidden in the process are identified and the findings used as the basis for an analysis of the existing management problems of construction companies. A new process model is then drafted in accordance with the analysis and the applications of management information technology systems. 2. Create the team-based organization: Based on the new process model, the team approach is used to integrate the cross-organizational functions into specific process teams. The team-based organization is a constitution of several process teams. 2. Bidding Success Ratio: a default value in the simulation system to generate a trigger event to enable the budget process. By counting the number of bidding successes in historical bidding data, the probability of success in bidding can be calculated. 3. Number of Subcontracts: For a given project, the procurement process will iterated several times depending on the number of subcontracts included in the project, while both the bidding/contract and the budget processes will only be performed once in every project. Therefore, statistical information about the number of subcontracts in a project is needed for the simulation program. Based on construction company historical data, the average, coefficient of variation, and standard deviation of number of subcontracts are calculated. 1. Project Start Time: describes the point at which a project is considered to have occurred; i.e., when managers accept an invitation to bid, this is the start time of the project. (1) Expectation and variance. The data is summarized, and the expectation and variance of durations of all activities in the process are calculated. End Fig. 2. The stages of process reengineering. description including activities involving laborpower. That is, the description includes process scope, activities, number of team members, and probability distribution function of occurrence of process enabling events. In addition, a set of laborpower allocation alternatives is derived taking into consideration the availability of human resources. [if i >3 0] successful ratio ≥ 90%? End Fig. 3. Simulation runtime procedure. project laborpower capability for one set of available laborpower can be determined by the test simulation progress. 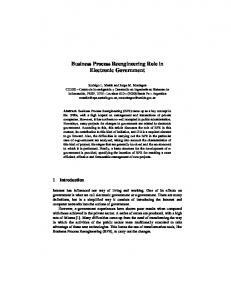 Information concerning alternative simulations, experiments and the test simulation. Start time, finish time, required laborpower, and the duration of activities. Early-start time, start time, finish time, last-finish time, laborpower requirement, duration, and laborpower idleness of the processes. Early start time, occurrence time, finish time, last-finishing time, laborpower requirement, duration, and total laborpower idleness of each project. Simulated results of one laborpower allocation alternative. Simulation result of one experiment (the allocation alternative with the least laborpower idle time). Summarized results of 30 experiments. business process reengineering project. The THRP model was applied to assist “Company A” with reengineering of the construction planning process and evaluating the rationality of human resource use in the newly designed process. an activity's functions and compiles information on the original organization, and (2) process modeling, which uses the Architecture of Integrated Information System (ARIS) modeling tool to create the original process model based on the collected data. Fig. 4. The organizational structure of “Company A” before BPR. ”Company A” was represented by using the ARIS modeling tool after the data collection task, and Fig. 5 shows the modeling results. project budget Manager of Const. Planning DEP. drawings & spec. Executive Vice Pres. Manager of Const. Planning DEP. bid examination report finished drawings & spec. Fig. 5. The original bidding/contract process in “Company A”. Fig. 6. The new bidding/contract process of “Company A” after BPR. Note. CES: Cost Estimation System. process based on the eEPC process diagrams created in the process representation step. Through discussion and brainstorming with the senior managers, this study located the hidden problems within the original bidding/contract process (shown in the Fig. 5) as follows: 1. Only quantity surveys were implemented with computeraided software while all other activities were completed manually; accordingly, the efficiency of the activities and the utilization of the laborpower were limited due to lack of full support from information technologies. 2. Job loading was not proportional to task divisions due to the magnitude of various construction projects. In fact, it is difficult to assign appropriate laborpower dynamically to proper groups in a functional organization structure. 3. No valid history reference data on material and labor was on hand to assist the estimator so that cost estimations failed to correspond with prevailing prices. 4. The time consumed by document circulation increased unexpectedly because all documents were required to be submitted to the managers. 3.1.3. Process redesign In this step, to fix the process defects, the process model was redesigned on process design principles  and a new process model created. Because information can be the “glue” that holds an organizational structure together , a cross-functional information system of cost estimation system was particularly applied. Some activities could be integrated and executed by cost estimation system. Moreover, certain approval activities, such as “review bidding examination reports” and “survey quotation tables” which were irrelevant to the objective of the process, were superseded and decision making activities delegated to the decision group. Consequently, the existing bidding/contract process was integrated into a shortened and efficient new process. One of the alternative process models is shown in Fig. 6. Fig. 7. The organizational structure of “Company A” after BPR. two situations: (1) the number of members of the construction planning team remained constant at seven, which was the total laborpower of the construction planning department; (2) the project loading was taken as a function of the number of team members, and the combinations of laborpower and project loading were estimated. The main purpose of the first simulation is to estimate the potential project loading that current laborpower can take. Therefore, the value of current number of personnel available was set in seven workers. Moreover, each team consists of one senior engineer and at least one junior engineer, so there were eight possible laborpower allocation alternatives for seven workers. Fig. 8 shows the allocation alternatives and the amount of projects which were simulated. Following the test simulation process shown in Fig. 3, all alternatives were simulated in one experiment, and thirty experiments progressed in one test. That is, there were in total 240 simulations for one specific project loading. As applying the forward scheduling method, the success ratio was always higher than 90% when the project loading was less than 25 projects. It decreased to 83% (less than the threshold of 90%) as the loading increased to 26 projects. Therefore, the maximum project loading for seven members was evaluated at 25 projects. Likewise, as the backward scheduling method was applied, the success ratio was always higher than 90% when the project loading was less 40 projects, but decreased to 80% as the loading increased to 41 projects. Therefore, the maximum project loading for seven members proved to be 40 projects when the backward scheduling method was applied. Because forward scheduling deploys the maximum resource at the beginning of a project to accomplish the process as soon as possible, laborpower capability might be limited by more resource conflicts than in the backward scheduling method. Therefore, this research speculates that optimum project loading falls between the two above referenced extreme cases. Based on this corollary, Company A's laborpower margin was adapted to a minimum of 25 projects and a maximum of 40 projects. CES denotes cost estimation system. In addition, the outputs of the simulation exhibit positive evidences of the advantages of process reengineering. That is, by comparing simulation results between the original process and the new, integrated construction planning process, we can see the laborpower capability increasing from 16 projects to 40 projects, and idled laborpower decreasing obviously due to the integration of functions. Unit of time: hour. NAP denotes Number of Personnel Available. Fig. 8. The possible laborpower deployment alternatives tree for the construction planning team with project loading (NAP = 7). Note. NPA: Number of Personnel Availabe; AOP: Amount of Projects. Fig. 9. Simulated output curves of the new construction planning process. provide decision-makers valuable information for human resource planning. References  M. Hammer, Reengineering work: don't automate, obliterate, Harvard Bus. Rev. (1990) 104–112. M. Hammer, J. Champy, Reengineering the Corporation—A Manifesto for Business Revolution, Harper Collins, New York, 1993. G.C. Patricio, H.W. Alfred, Graphical coordination of plant usage and personnel, J. Constr. Div. 104 (1) (1978) 43–55. P.M. Jerome Jr., Engineering Scheduling with Manpower Allocation, J. Prof. Act. 101 (2) (1975) 107–115. F.M. William, Strategic planning for human resource management in construction, J. Manage. Eng. 13 (3) (1997) 49–56. S.M. AbouRizk, D.W. Halpin, Probabilistic simulation studies for repetitive construction processes, J. Constr. Eng. Manag. 116 (4) (1990) 575–594. D.W. Halpin, An Investigation of the Use of Simulation Networks for Modeling Construction Operations, PhD Thesis, Univ. of Illinois at Urbana-Champaign Ill., 1973. D.W. Halpin, CYCLONE: method for modeling of job site processes, J. Constr. Div., ASCE 103 (3) (1977) 489–499. T.M. Zayed, D.W. Halpin, Simulation as a tool for resource management, Proceedings of the Simulation Conference, Winter 2000, pp. 1897–1906. T.M. Zayed, D.W. Halpin, Simulation as a tool for pile productivity assessment, J. Constr. Eng. Manag., ASCE 130 (3) (2004) 384–404. J. Shi, S.M. AbouRizk, Resource-based modeling for construction simulation, J. Constr. Eng. Manag., ASCE 123 (1) (1997) 26–33. O. Salem1, S. AbouRizk, S. Ariaratnam, Risk-based life-cycle costing of infrastructure rehabilitation and construction alternatives, J. Infrastruct. Syst. 9 (1) (2003) 6–15. L.E. Bernold, Simulation of nonsteady construction processes, J. Constr. Eng. Manag. 115 (2) (1989) 163–178. B.A. Senior, D.W. Halpin, Simplified simulation system for construction projects, J. Constr. Eng. Manag., ASCE 124 (1) (1998) 72–81. J. Yan, R.E. Levitt, Computational organization analysis for designing concurrent engineering teams, Proceedings of the Computing in Civil Engineering, 1995, pp. 1090–1097. J. Yan, R.E. Levitt, Approaches to simulating organizational behavior of concurrent design teams, Proceedings of the Computing in Civil Engineering, 1996, pp. 281–287. M.Y. Cheng, M.H. 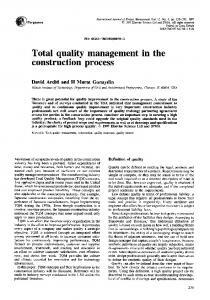 Tsai, Reengineering of construction management process, J. Constr. Eng. Manag. 129 (1) (2003) 105–114. T.H. Davenport, Process Innovation, Harvard Business School Press, Boston MA, 1993. D.A. Marchland, M.J. Stanford, Business process redesign: a framework for harmonizing people, information and technology, in: V. Grover, W.J. Keltinger (Eds. 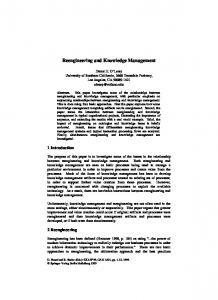 ), Business Process Change: Reengineering Concepts, Methods and Technologies, IDEA Group Publishing, 1995, pp. 35–56. M.Y. Cheng, C.W. Su, H.Y. You, Optimal project organizational structure for construction management, J. Constr. Eng. Manag. 129 (1) (2003) 70–79. J. Thomsen, Y.J. Kwon, R.E. Levitt, J.C. Kunz, Simulating the effects of goal incongruency on project team performance, Proceedings of the Computing in Civil Engineering, 1997, pp. 643–650. 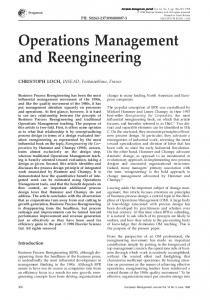 Report "Construction management process reengineering - CiteSeerX"